The Dashboard Page is the first page a user is directed to after a successful login action. You can also navigate to this page using the Dashboard menu item in the navigation bar. After an initial login, the Dashboard page will show you the auto-discovered local Adapter component. Under the Stop dropdown. Force Stop this Adapter (doesn’t wait for services to finish) and free up any resources that it has used. L. This area is for ‘top level’ functions, i.e. Add another Adapter to the UI, Refresh all the details on the Dashboard Page for all the Registered Adapters or Switch between the Widget and Table mode. Ticking the Show Channels checkbox in the Adapter control bar will expand the Adapter area and show a list of its Channel components. B. Name: The Channel unique Id used in the adapter configuration. C. Up/Down Time: This indicate the Channel up time if the Channel is started or the down time if the Channel is stopped. D. Failed Messages: The number of failed messages is indicated by a red number next to a red envelope. If the number is 0 the envelope will be grey and the number green. Ticking the Show Workflows checkbox in the Channel control bar will expand the area and show a list of its Workflow components. Name: The Workflow unique Id used in the adapter configuration. Last Started/Stopped: The Workflow last started time is indicated if the Workflow is started otherwise the last stopped time is indicated it the Workflow is stopped. Up/Down Time: This indicate the Workflow up time if the Workflow is started or the down time if the Workflow is stopped. Failed Messages: The number of failed messages is indicated by a red number next to a red envelope. If the number is 0 the envelope will be grey and the number green. The control bar: Allows a user to perform several actions on the Workflow. As with all the pages in the Interlok UI, on smaller screens, such as a tablet, the page will display slightly differently, to make best use of the smaller size constraints. Note: Although pages will look different on smaller screens, most (if not all) of the pages features are still present, but they may be grouped into button drop down selects, or they may be missing their text labels. One feature that’s noticeably absent from smaller screens is the Configuration Page, as it’s features would be too difficult to use on a phone sized screen. On the Dashboard page, clicking on the Adapters ‘Show Config’ button will open a modal window containing the Adapter configuration. This is presented in two different formats, XML and Diagram modes; The XML mode is a read-only display of the Adapter configuration in a formatted XML display. The Diagram mode is a visual representation of the Adapter configuration. After pressing the Show Config button, the Config modal window will appear. Shown above is the view that appears after pressing the Show Config button, the Config modal window will appear and the XML view will be shown as default. In this view users are able to collapse and expand XML elements. 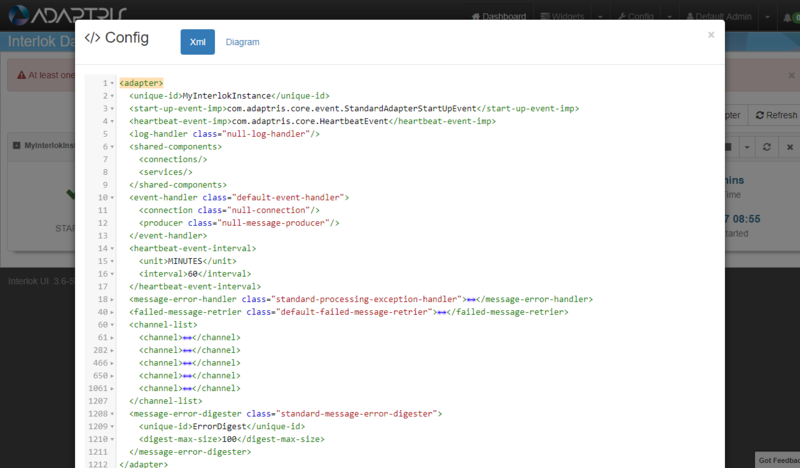 This is a read only view of the XML config, and any changes made here would not be applied to that Adapter. Using the diagram button on the top of the config modal will present the user with visual representation of the Adapter configuration. Present a downloadable version of the diagram. This function will open a new window with the full image that the user can save locally. The mouse left button can be clicked and held to allow users to navigate around the zoomed in diagram. Note: This generated diagram represents a simplified Adapter config in a waterfall type manner. The top left corner box represents the Adapter, its children boxes represent the channels and their children represent the workflows. The workflows have been extended using a dashed area to show the consumers, services and producers. Not every component is shown in this simplified diagram, notable absentees include Workflow Interceptors and Service Collections within a Workflows Service List. On the Dashboard Page, if any of the registered Adapters have failed messages, then a disposable alert is shown to warn the user. Note: The badge icon on the Failed Messages section of the Adapter area will give a real time count of the amount of failed messages. 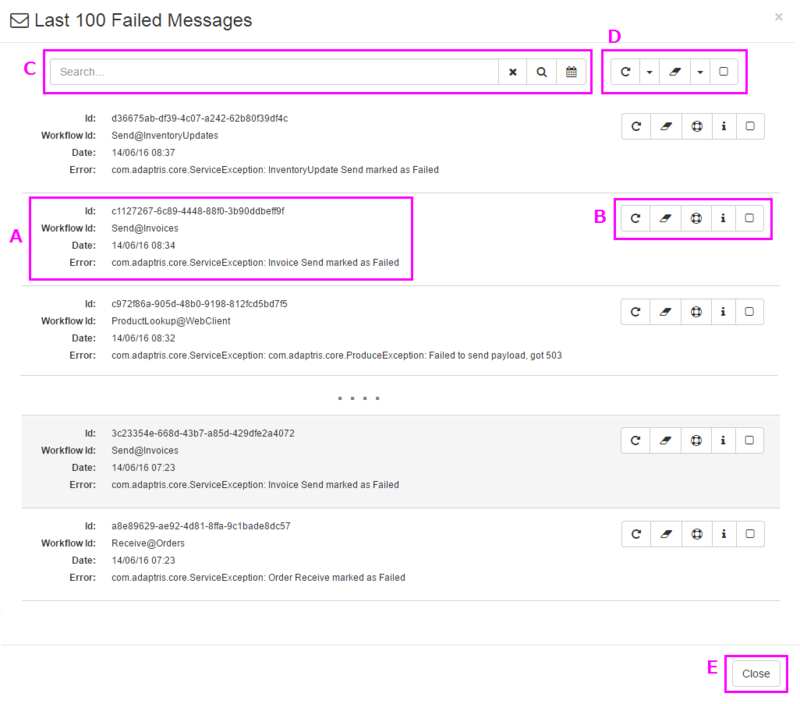 In order to get the number of failed message working a ‘Standard Message Error Digester’ will need to be added to the adapter configuration. 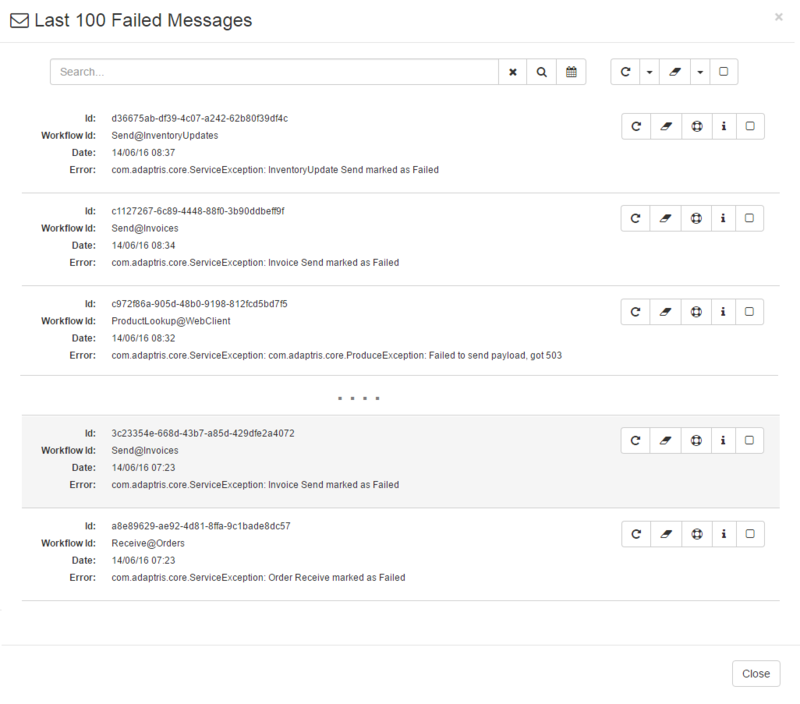 Clicking on the Failed Messages details block will open the Failed Messages modal window containing the last hundred failed messages. 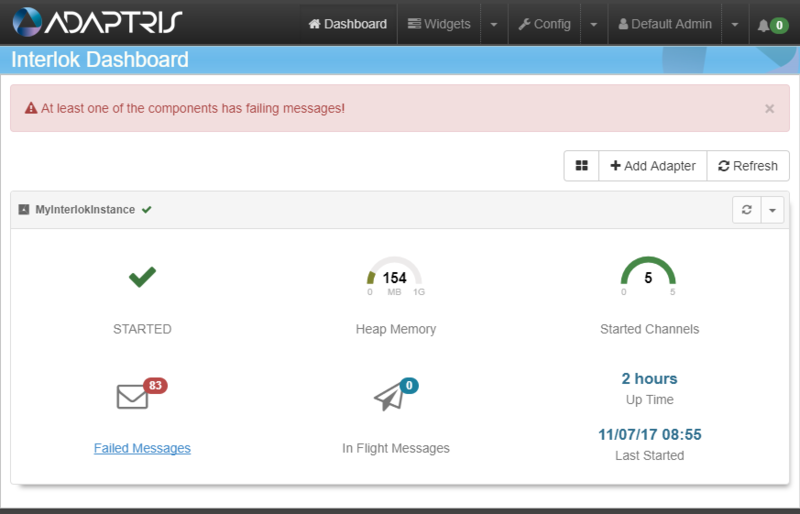 The above image shows a typical Failed Messages modal window page with a handful of failed messages. Ignore the failed message; this will remove the message from the UI failed messages list, without retrying it. E. This button can be used to Failed Message modal window. If the local Adapter is not shown (e.g. previously removed) or if a user wishes to monitor another Adapter, the Add Container button of the Dashboard page can be used. Clicking on the Add Container button will open the Add Adapter modal window which contains a form that allows you to register an Adapter to the UI. Name: This property is for display purposes and also an easy way to differentiate Adapters registered within the UI web application. Adapter Unique Id: This is the Adapter unique identifier used in the Adapter configuration XML file: <adapter><unique-id>adapterUid</unique-id</adapter>. 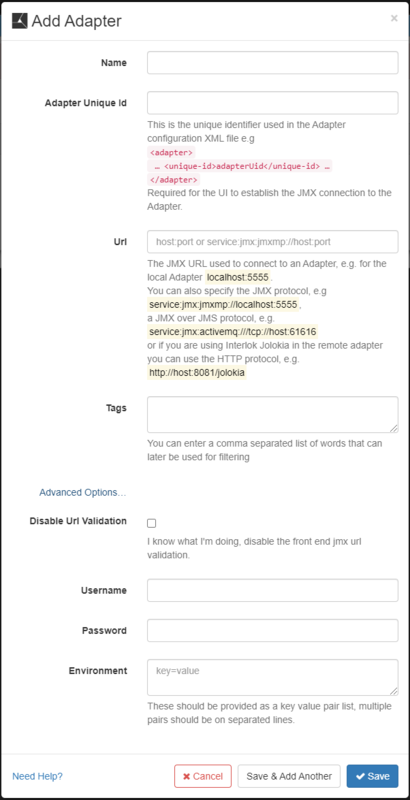 This is required for the UI to establish the JMX connection to the Adapter. 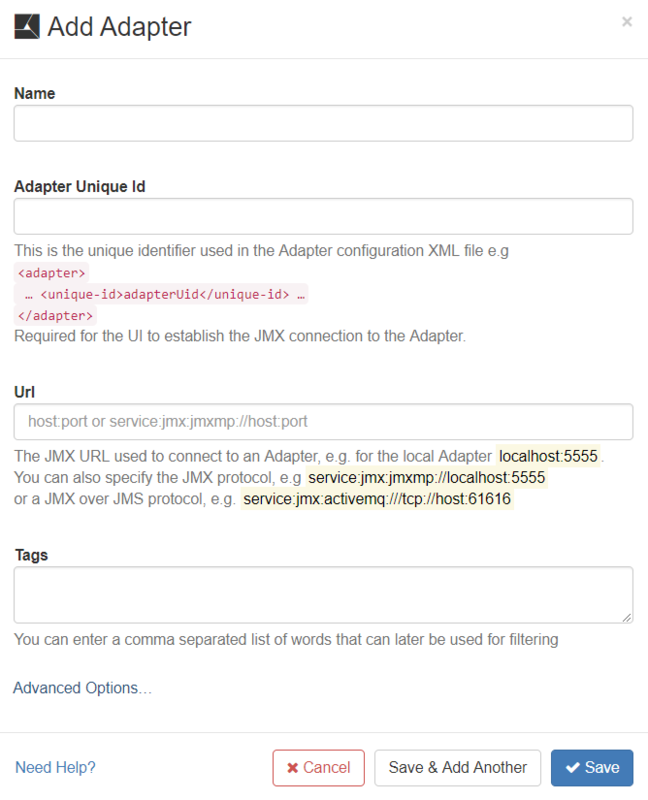 Adding more than one Adapter will result in having a list of Adapter components listed on the Dashboard Page. Since 3.7.3 the dashboard page can display the Adapters in a table mode. This new mode make it easier to monitor several Adapters. Since 3.7.3 when creating an Adapter you can also add one or many tags that can be used for filtering. If at least one Adapter has a tag the tag list will be displayed above the Adapter list or table.